Moon square Neptune in the natal chart makes you extremely sensitive, deeply sympathetic and acutely perceptive. Relationships with women and the public will have a major influence on your emotional well-being and how sociable you are. How you mother nurtured you is more important than with most other people. This is because you are so sensitive to subtle energies, non-verbal cues and even other people’s thoughts via telepathy or psychic abilities. If your mother instilled any negativity it will have greatly shaped your life. Such negative impressions may have involved her acting as a victim or actually being abused by your father, and escapism in general through drugs, alcohol or gambling. As an adult, as when you were young, your reaction to any unpleasantness or over stimulation would be to withdraw into your own imaginary world that is safe and emotional stable. Healthier mother-child relationships would of course lead to a healthier emotional life. However, you should expect to meet many challenging experiences and relationships with women that test your emotional fortitude. Expressing your emotions is key to dealing with this aspect. You must be able to show your sensitive emotions in relationships and in groups so they do not manifest as internal imaginations, false realities, suspicions, paranoia, depression, addiction or illness. Sharing your emotions and talking about your perceptions or visions or dreams will give you vital feedback and help put everything into perspective. Show your sympathies to others and you will be appreciated. This is a strong point because you understand suffering and can ease it in others. Share also your sufferings and people will listen. Such openness will avoid any need to be the victim or the savior. You’re a dreamer and a storyteller who can shapeshift into any form. These are talents that can be used in poetry, acting, writing and singing and the list goes on. Any shyness can be overcome by getting familiar with your image. Neptune rules mirrors, screens, cameras and the stage. Practice showing off in front of the mirror or webcam. Of course privacy is important but do not keep your talents secret forever. Transiting Moon square Neptune can bring strange feelings or experiences that leave you questioning reality. Chances are that you are not perceiving things correctly. You may be deluding yourself or being deceived by enemies. Best not to react too seriously to begin with and avoid making important decision based on first impressions. It is more easy to be hurt now because you are extremely emotionally sensitive. You are also more vulnerable to deception and being taken advantage of because your confused state can be easily recognized by deceitful people. This is not the best time to get a psychic reading and you should avoid reading too much into dreams or superstitions. If you are a drinker or drug user then take precautions as your tolerance will be lower than usual. You can be happy and healthy at this time by escaping reality safely. Try sleeping in, story writing, coloring in, singing or watching movies. Seek entertainment or anything creative to satisfy your imagination. At another level you will be feeling more empathy for others. You may experience suffering yourself or be touched by it in some way. Don’t hide this sensitive, caring side of yourself but share it openly. Tell someone if you are suffering or lend a helping hand to someone in need. 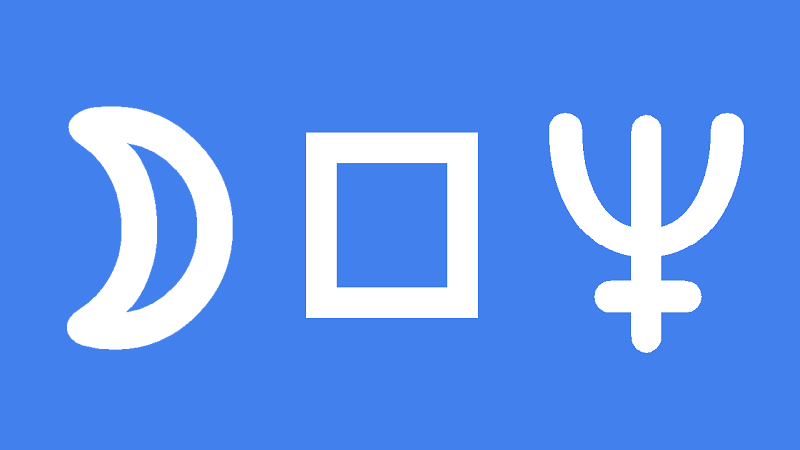 This interpretation for Moon square Neptune transit applies to a lunar eclipse and full moon square Neptune. Helmut Kohl 0°06′, Francoise Rosay 0°06′, Elizabeth Prentiss 0°07′, Arnold Bax 0°08′, Michael Douglas 0°20′, Chaka Khan 0°22′, Moses Annenberg 0°33′, Jason Connery 0°40′, King Louis XVI of France 0°45′, Meghan Trainor 0°53′, Brigitte Bardot 0°55′, Heinrich Himmler 1°00′, Al Pacino 1°26′, Salvador Dali 1°33′, Rihanna 1°37′, Camilla Parker-Bowles 1°43′, Kanye West 1°44′, Serena Williams 1°50′, Warren Buffett 1°51′, Justin Bieber 2°05′ Anthony Hopkins 2°56′, Yoko Ono 2°03′. Jamie, if Neptune is conjunct my 11 degree Pisces Sun, how far away does it need to be for a psychic reading? Would the reading be more accurate when it passes my Sun and before it goes retro at 14 degrees…. I’m curious as an astrologer told me a long time ago you can not do a psychic reading with Neptune conjunct your sun…….you have my curiosity now because of your comment with the Moon square Neptune……..I love your articles…….are you doing readings now. I know you said awhile ago you were going back to readings for your regular clients. In regards to your marriage I hope it is a lifetime of bliss! When Neptune is conjunct your Sun you ARE psychic, if only temporarily. Pay especially close attention to your dreams.